A team from SR Timber has raised more than £3,450 for charity after completing a car rally that took them through ten European countries in four days, ending in Monte Carlo. 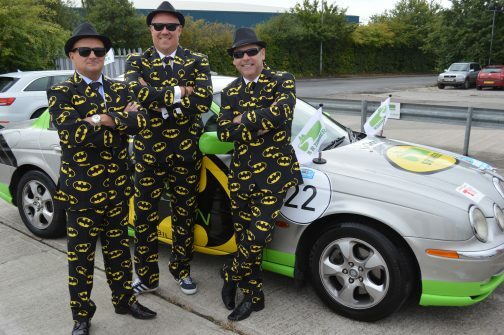 That figure is set to rise as money continues to pour in for the team of three, who entered their converted Bat-ten Mobile in the Pavestone Rally to raise money for two charities: the Rainy Day Trust and the Teenage Cancer Trust. Trading Director Shaun Revill, Business Development Manager Jason Lumley and Operations Manager Steve Hill are expecting the sale of the S-Type Jaguar that they bought for the rally to net them more cash as they finalise the total in the coming weeks. The trio are delighted with the money that they have raised in a challenge that saw them buy a road-legal car that cost less than £500 and drive it through countries including France, Austria, Italy and Germany, with a series of time trials and challenges along the way. Shaun, Jason and Steve admitted that the rally was more demanding than they had expected but were delighted with the money already raised and the level of pledges still to come in. The team said: “The Pavestone Rally was a great event and we had lots of fun, but covering so many miles through all those countries in a short space of time was gruelling – especially as we set off half a day behind everyone else, as our car broke down in Dover! “There were also loads of challenges along the way, such as swapping clothes with complete strangers, singing ‘happy birthday’ to one unsuspecting person, covering one of our team in toilet roll, making a snow angel and getting ten local people to touch our car at the same time. “Although the ‘good luck’ message from The Who lead singer Roger Daltrey blew us away and the drive into Monte Carlo was amazing, the highlight of the rally was probably driving along the Stelvio Pass – which was voted the best driving road in the world by BBC’s Top Gear because of its wall of 48 switchback turns through the Alps. SR Timber is getting a taste for taking part in charity fundraising events after Jason and colleague Richard Stone raised more than £5,000 last year for the British Heart Foundation after scaling Africa’s highest peak, Mount Kilimanjaro.